The Delaware quarter was the very first coin released in the 50 State Quarters series. The reason Delaware was the first one is because new designs in the series were released in the order each state joined the Union — and Delaware was the first state to do so. This is in part due to Caesar Rodney, the man you see riding the horse on Delaware quarter. But I’ll talk about that a little more in a moment. Did you know?… There’s a valuable error on the Delaware state quarter that is worth looking for! Today, I’m going to talk about the 1999 Delaware quarter error (that has become known as the Spitting Horse quarter). I’ll also be sharing some really cool facts about the Delaware quarter and the state that this coin honors. And… if you’re curious about how much Delaware quarters are worth and want to know how to find the Delaware quarter error, then read on! How Much Is A Spitting Horse Quarter Worth? If you have one of these state quarter error coins, you’ll be happy to know that it’s worth a nice chunk of change. The Delaware state quarter error is worth between $3 and $20, depending on its condition — which isn’t bad for a quarter you can find in your pocket change for only 25 cents! How Did The Delaware Error Coin Happen? 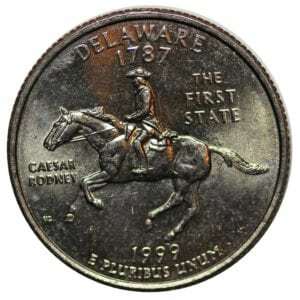 The Spitting Horse Delaware quarter error was caused by a die crack running from the mouth of the horse that Caesar Rodney is riding all the way down through the “C” in “Caesar”. This error is found on only 1999-P Delaware quarters, which were struck at the Philadelphia Mint. Nobody is quite sure how many were made — but based on the number of collectors who’ve found these error quarters there are probably several thousand specimens of this Delaware quarter error floating around. These error quarters were big news back when the 50 State Quarters program first started. To this day, hobbyists still enjoy collecting the unusual Spitting Horse quarter error. Wondering how to find the Spitting Horse quarter today? How Much Are Other Delaware Quarters Worth? The Philadelphia Mint struck 373,400,000 Delaware quarters. Each 1999-P Delaware quarter is worth face value if worn, or about 75 cents to $1.50 if the coin is in typical uncirculated condition. The Denver Mint produced 401,424,000 Delaware quarters. All 1999-D Delaware quarters have a value of 25 cents if worn, or about 75 cents to $1.50 if it’s a normal uncirculated example. The San Francisco Mint made 3,713,359 copper-nickel clad proof Delaware quarters and 804,565 silver proof Delaware quarters. Most 1999-S clad proof Delaware quarters are worth about $1.50 to $3 each, while 1999-S 90% silver proof Delaware quarters go for about $5 to $7 apiece. While Delaware quarters are generally pretty common in terms of mintage numbers, there was a time when they were quite difficult to find. When the 50 State Quarters program began on January 4, 1999 with the release of the Delaware quarter, millions of people began checking their change to collect each of the new state quarters that were released about 10 weeks apart until 2008. The final quarter in the series honored the 50th state of Hawaii on November 3, 2008. The 50 State Quarters were so popular, even Kermit the Frog of Muppets fame got into the action as the United States Mint “spokesfrog”! At one point, the US Mint estimated about 100 million people were collecting the 50 State Quarters. That’s a lot of people saving those state quarters! And that’s why it was so challenging to find many of the state quarters when they were new. Personally, I remember looking for weeks and weeks before I found the first Delaware quarter in my pocket change in 1999. Since those times, a lot of people have spent the 50 State Quarters they once saved — which is why the Delaware quarter is easier to find these days in circulation. Caesar Rodney, seen on the Delaware quarter riding his horse, was the man who helped break an impasse concerning our nation’s independence during a meeting of the Continental Congress in Philadelphia. When Rodney, who was 70 miles south in Dover, Delaware caught wind of the deadlock, he got on his horse and made the day-long trek north to vote. He signed the Declaration of Independence on August 2, 1776. 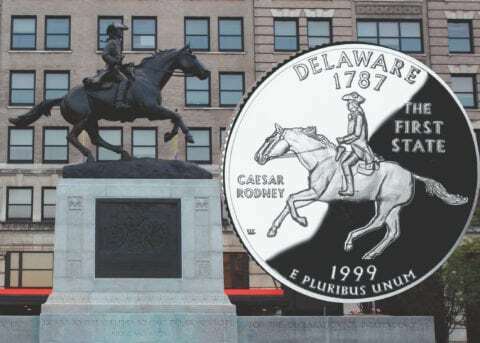 The coin’s design, featuring Caesar Rodney on his horse, was inspired by a statue of the Founding Father and his horse that stands in Rodney Square — a public park in downtown Wilmington, Delaware. The reverse (tail’s side) design on the Delaware quarter was inspired by a design submitted by artist Eddy Seger, who depicted Caesar Rodney and his horse alongside ornamental vegetation and an outline of the state of Delaware. His design was adapted by designer William Cousins, who made over the quarter’s Washington portrait on the obverse in 1999 and is largely credited for the Delaware quarter reverse appearance. Many claim that Seger was not properly credited for the design, leading to a numismatic controversy some call quartergate.